I thoroughly enjoy working with shrunken manuscripts. I first heard of this method through Darcy Pattinson's website and have since used it in many different ways, from tracking characters as they appear on page to keeping track of the passage of time. 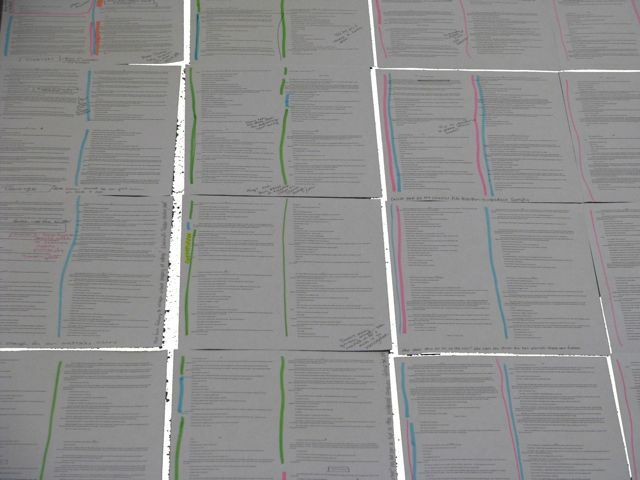 Any time I want a big picture of the entire novel, I either deal out note cards or work with a shrunken manuscript. The manuscript is printed in tiny font, 4 pages per sheet, with removal of headers, footers, and chapter breaks. I leave in the double spacing and keep the font just barely readable and my 90,000 words fit on 50 pages. Today I'm working on simplifying the structure of my first Claire Morgane novel. The pink lines signify the major through-line. This is the big picture for the book. The blue is a subplot that often overlaps with the main plot--but I have a terrible habit of getting lost in the blue and forgetting the pink. (Big picture helps me identify those places where I need to focus, focus, focus.) Yellow marks a smaller subplot that should appear beginning, middle and end. Green marks entire scenes I'm ready to lift. The important details from these scenes will be worked into other sections of the book. One thing I heard time and time again at conferences this summer: make your scenes work double or triple duty. It's not enough that a scene be critical to your book. It has to be worth its page space as well. Forget writing a long, endearing scene based around a tiny critical plot point. If the tiny critical plot point can be dropped into another scene, the long, endearing scene goes. What a great system! Computers are great, don't get me wrong, but something both tactile & visual is sure to be a really effective tool. My thanks to Darcy Pattinson and yourself for passing this along! That's cool...I do something similar to that while working on my screenplay. It's called "scene cards". The color coding works the same, but on my cards I write: 1) description of scene 2) purpose of scene 3) character objective (as nec) 4) character obstacle...It helps a whole lot, as I imagine this method does for you! Reducing a complex project to an easily assimilated overview. Brilliant. This is a great system! Thanks for the idea. I'm currently using notecards with key plot points on them to keep myself organized and focused as I write the first draft, but this will be extremely helpful in the first or second edits.